National discourse on science, technology, engineering, and mathematics (STEM) urges educators to attend to the growing demand for a STEM-literate populace. But, what is “STEM-literacy,” and how do we, as educators, cultivate opportunities for students to enhance their STEM-literacy, as well as their STEM content knowledge and affect? In this session, I will share action research (conducted at the university and high school levels) that aims to understand the impact of engineering modules on students’ cognition and affect. 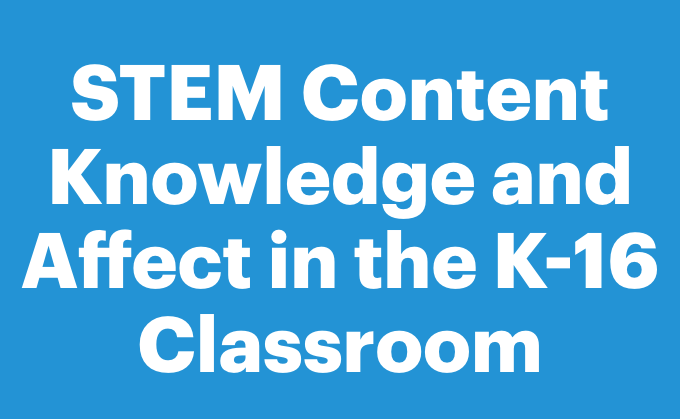 I will share the framework for STEM-literacy and affect, as well as the data collection tools and analysis methods that can be adapted for use in your classroom. My name is Christelle Rocha (@Maestra_Rocha), I’m a 7th and 8th grade math teacher in Los Angeles, California and Desmos Fellow, Cohort 3. I’m excited to join the Global Math Department and want to introduce myself by sharing my top five, all-time favorite pieces. 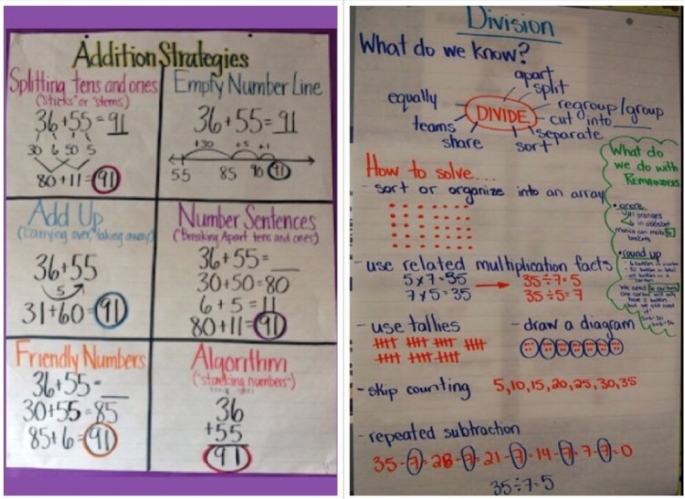 In Strategies versus Models: Why This is Important, Pamela Harris (@pwharris) challenges me to rethink my views of math and math instruction. Marian Dingle (@DingleTeach) and Jose Vilson (@TheJLV) speak on my “why” for teaching math. While Marian’s powerful thread shows the individual, day-to-day impact of math education, Jose speaks on the broader implications of our work in Math as a Social Justice Lever. As fulfilling and vital as teaching can be, Is the first-year teacher in your life crying in the car? Here are five things you should know by Roxanna Elden (@RoxannaElden) and Teaching Saves My Life Every Single Day by Christina Torres (@biblio_phile) remind me teaching is exhausting for everyone, which means self-advocacy and self-preservation are essential to continue doing the work I love. Perhaps you are like me and you have a semi-long commute to and from school everyday. Or perhaps you’re like me and you run long distances at a time. Either way I have found out that these are both perfect conditions to listen to podcasts. The podcasts about true crime or the life of Americans (see what I did there?) are the ones I usually like to fill my time. But I saw this tweet from Mike Mohammad (@Mo_physics) and realized there is an entire subculture of podcasts that focus on educators. He pulled all the recommendations and created a blog post that you can find here. There are some great recommendations of people like Jennifer Gonzales (@cultofpedagogy) who’s blog I have been reading for years. In search of some more math specific podcasts, I found this article with recommendations like “My Favourite Theorem” (@myfavethm) which hosted Fawn Nguyen (@fawnpnguyen) on a recent episode. What education-based podcasts am I missing out on that I really need to give a listen? Which one from these suggestions are you ready to try? I’ve been doing a lot of thinking about math modeling and facilitating some workshops with teachers. We’ve been using math modeling as an anchor through some lesson study work and it’s been fantastic. Robert Kaplinsky has three webinars about math modeling, one each for elementary, middle, and high school teachers. They are well worth the watch and useful for workshops. Give them a watch and let him know what you think. Dan Meyer spoke on a panel about math modeling. He said it got a bit awkward. Read his blog post to find out more. He’ll leave you thinking. 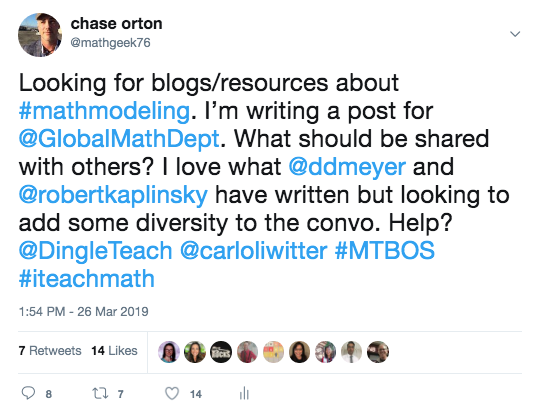 I sent out this Tweet to see what the #MTBoS community had to share about math modeling, what it looks like, and how we can teach it better in our classrooms. Click on the Tweet to find the thread. Stay nerdy my friends! Got something you think should go into the GMD Newsletter, hit me up on Twitter at @mathgeek76.